Left: KVH’s IP-MobileCast content delivery service brings news, sports, movie, and TV content on board via satellite, a great boost for crew welfare. 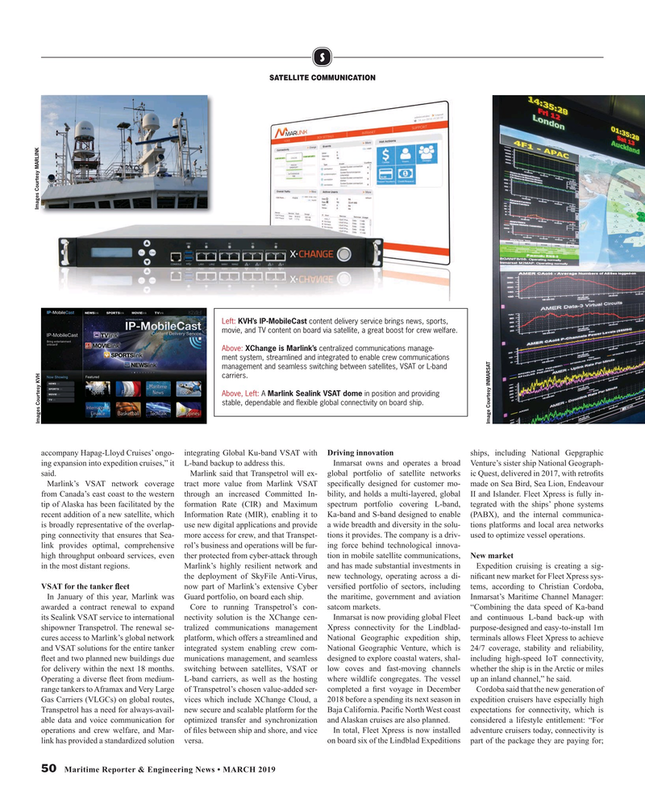 Above: XChange is Marlink’s centralized communications manage- ment system, streamlined and integrated to enable crew communications management and seamless switching between satellites, VSAT or L-band carriers. Above, Left: A Marlink Sealink VSAT dome in position and providing stable, dependable and ? exible global connectivity on board ship. Marlink’s VSAT network coverage tract more value from Marlink VSAT speci? cally designed for customer mo- made on Sea Bird, Sea Lion, Endeavour from Canada’s east coast to the western through an increased Committed In- bility, and holds a multi-layered, global II and Islander. Fleet Xpress is fully in- tip of Alaska has been facilitated by the formation Rate (CIR) and Maximum spectrum portfolio covering L-band, tegrated with the ships’ phone systems recent addition of a new satellite, which Information Rate (MIR), enabling it to Ka-band and S-band designed to enable (PABX), and the internal communica- is broadly representative of the overlap- use new digital applications and provide a wide breadth and diversity in the solu- tions platforms and local area networks ping connectivity that ensures that Sea- more access for crew, and that Transpet- tions it provides. The company is a driv- used to optimize vessel operations. Operating a diverse ? eet from medium- L-band carriers, as well as the hosting where wildlife congregates. The vessel up an inland channel,” he said.